I had the pleasure of visiting one of my favorite New Jersey Eateries recently. It’s a place that I’ve been, um I don’t know, like a hundred times before, and is definitely a favorite for baked goods and sweet treats in the area. 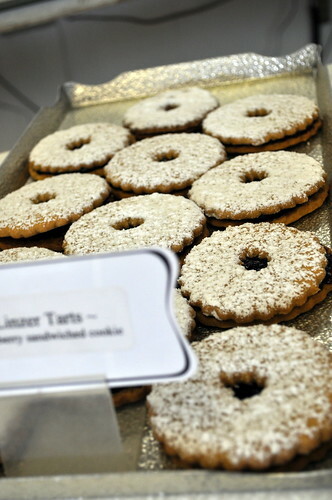 The Holland American Bakery is a staple for both American traditional treats such as chocolate chip cookies, layered cakes, varieties of doughnuts, as well as, Dutch delicacies that are truly authentic and delicious, such as Krakelingen, sugared twisty cookies, and Almond filled cookies, Gevulde Koeken. This bakery offers top of the line baked goods, but that is not all they have. They boast a large selection of breads, stollens, cheesecake, pies, tarts, and even custom order wedding or special occasion cakes. Let me begin by telling you some of my personal favorites. Every time I visit the Holland American Bakery, I tend to walk out with at least a dozen doughnuts. Their Old-Fashioned Doughnuts are the best. It’s a moist, cake-like doughnut covered in classic cinnamon sugar. They also boast fruit filled doughnuts ranging from blueberry to raspberry to lemon and apple, all yummy choices, but the blueberry is a family favorite. It has actual blueberries in the filling unlike most other doughnuts I’ve had. Another favorite here are the chocolate brownies. They are super fudgy, topped with smooth chocolate icing. Another treat I look forward to there are the Qua-chocolate cookies and the chocolate spritz cookies. Both have a thick chocolate frosting piled on top of either cocoa or butter cookies respectively. 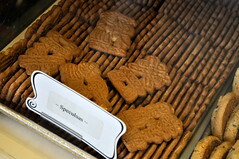 Some of their popular items include the classic speculaas. These Dutch specialty cookies have a spicy, cinnamon flavor and are shaped like windmills. 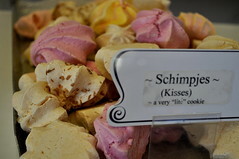 Another top seller is Schimpjes, an airy meringue type cookie shaped like small kisses. 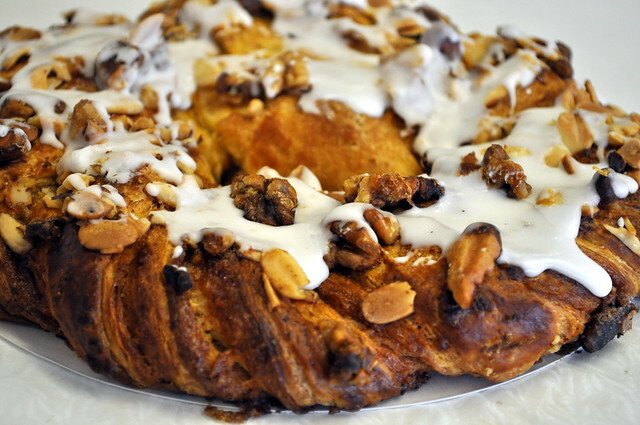 More hot items are the assortments of coffee cake rings drizzled with white icing and various nuts. But you need not be familiar with Dutch fare to enjoy this bakery. They have plenty of American treats to satisfy and the Dutch sweets are quite yummy and offer something new to try for those of us unfamiliar with their Dutch delights. Why not try something new and unique? There are plenty of confections, either Dutch or American, to leave you in a happy sugar coma as you leave the store. The Holland American Bakery is a third generation bakery that has been family run since the Valkema family came to American from Holland and they have been turning out Dutch specialties and American desserts ever since. They have continually added more features to their bakery, from Delft collectibles to novelty items such as Dutch cook books, and varieties of Dutch hard candies and licorice, cheeses, and other novelty items, including wooden shoes! They now even offer an online-store featuring much of their sweets and collectibles via their website, www.hollandamericanbakery.com. 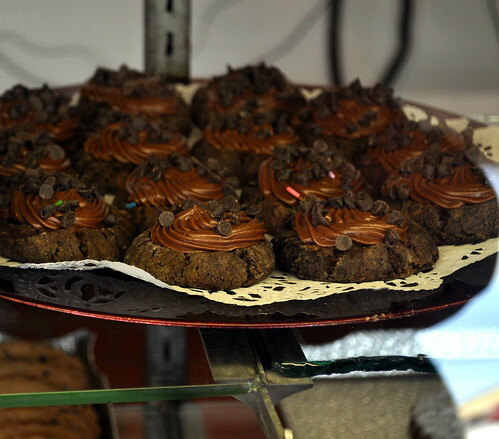 The family owned bakery is run by very hospitable employees who have always been courteous and friendly. You will feel as though you walked into another country when taking in the decor of this quaint bakery. Once you have fully viewed all the sweets in glass cases, be sure to take note of all the other Dutch specialties. While small in size, this bakery has every wall covered in blue and white ceramic Delft wares such as dishes, tea sets, tiles, and ceramic collectibles. 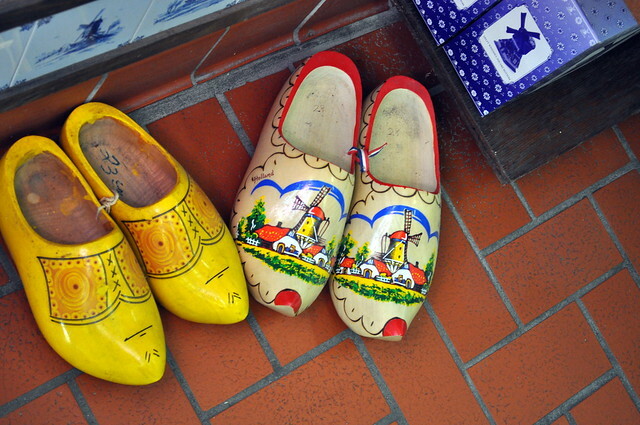 All the scenery depicts classic Dutch imagery from tulips to wooden shoes. 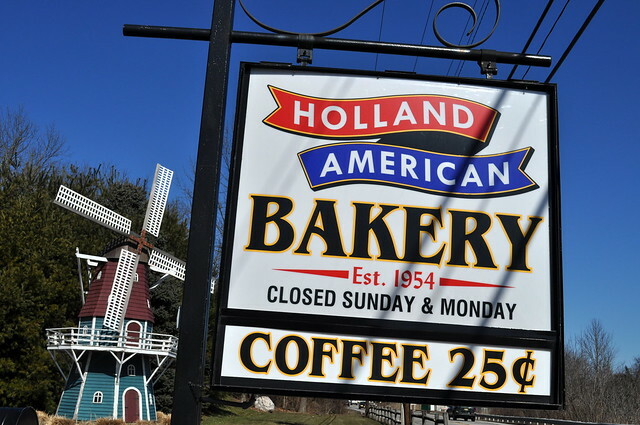 If you ever find yourself in the area, be sure to stop by the Holland American Bakery for cup of their famous 25¢ coffee and a delicious snack! The bakery is located at 246 Route 23 in Sussex, NJ 07461 and is open from 6 am to 6 pm Tuesday through Saturday. Amanda Waters is thrilled to be working with Jersey Bites for Sussex county, with occasional stops in other counties along the way. Her passion for “all things food” stems from growing up in an Italian-American kitchen. A lifelong Jersey girl, she only left for college and then returned to Sussex County. Amanda is newly married to her husband, the ultimate food taster, traveler, and photographing companion. She also writes for her blog, Our Italian Kitchen, where she shares family recipes and fun cooking adventures.